A rock band from Essex who became the first unsigned act to enter the UK top 40 through downloads have finally signed a record deal. 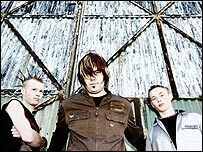 Koopa, a three-piece from Colchester, signed a five-year, four album deal worth about £128,000. They will play a gig in Moscow next month before they begin recording their album with Pied Piper Records in March. Their download-only single Blag, Steal and Borrow debuted at number 31 last year after a change in chart rules. Rules were changed at the start of last year to allow digital single sales to count towards a chart position even if there is no CD version. Before that date an artist needed to release singles on CD or another physical format to qualify for the chart. Koopa have been together for eight years in various forms and have built up a fanbase on the internet and on the live circuit.